The Sudbury Neutrino Observatory (SNO) results have provided revolutionary insight into the properties of neutrinos and the core of the sun. The detector, shown in the artist's conception below, was built 6800 feet under ground, in INCO's Creighton mine near Sudbury, Ontario, Canada. SNO was a heavy-water Cherenkov detector designed to detect neutrinos produced by fusion reactions in the sun. It used 1000 tonnes of heavy water loaned from Atomic Energy of Canada Limited (AECL), and contained by a 12 meter diameter acrylic vessel. Neutrinos reacted with the heavy water (D2O) to produce flashes of light called Cherenkov radiation. 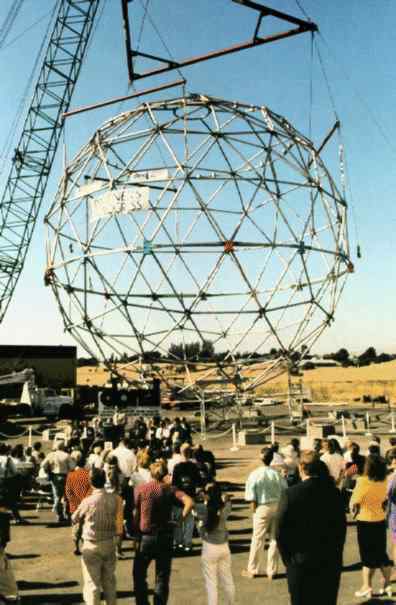 This light was then detected by an array of 9600 photomultiplier tubes mounted on a geodesic support structure surrounding the heavy water vessel. The detector was immersed in light (normal) water within a 30 meter barrel-shaped cavity (the size of a 10 story building!) excavated from Norite rock. Located in the deepest part of the mine, the overburden of rock shielded the detector from cosmic rays. The detector laboratory, still functioning as part of the new SNOLAB facility, is extremely clean to reduce background signals from radioactive elements present in the mine dust which would otherwise hide the very weak signal from neutrinos. Plans are currently underway to upgrade the SNO detector for the new SNO+ experiment. Nov. 8, 2015: SNO shares the 2016 Breakthrough Prize in Fundamental Physics. Oct. 6, 2015: Art McDonald shares the 2015 Nobel Prize in Physics. July 2013: Cocconi Prize of the European Physical Society awarded to the SNO and SuperKamiokande Experiments. Sept. 9, 2011: Art McDonald awarded the Henry Marshall Tory Medal of the Royal Society of Canada. Apr. 14, 2011: David Sinclar awarded the 2011 CAP-TRIUMF Vogt Medal. Apr. 13, 2010: Art McDonald awarded the 2010 Killam Prize. Nov. 12, 2009: SNO Technical Reports now available for download. May 15, 2009: Art McDonald elected to UK Royal Society. Apr. 26, 2007: Art McDonald awarded the 2007 Franklin Medal in Physics. Feb. 20, 2007: Art McDonald appointed to the Order of Canada. Nov. 15, 2006: SNO celebrates the receipt of the John C. Polanyi Prize from NSERC and the completion of very successful operations with heavy water. Read the press release (PDF, DOC) and backgrounder (PDF, DOC) for details. June 5, 2008: SNO publishes NCD-phase results (download PDF). May 28, 2007: Heavy water completely drained from acrylic vessel. November 28, 2006: End of data aquisition with NCD's and heavy water. February 28, 2005: SNO publishes 391-day salt-phase results (download PDF, Postscript or figures). January 2005: Production data taking with NCD array installed. April 21, 2004: NCD testing and repairing is complete and the ROV is removed from the detector. February 12, 2004: The NCD's are all installed and we begin the third phase of detector operation. September 7, 2003: SNO releases Salt Phase Results. May 2003: NCD pre-deployment welding has just been completed. NCD deployment is scheduled for August. April 20, 2002: New scientific results released. June 2001: SNO releases its First Scientific Results on Monday, Jun 18 at 12:15 EDT. May 2001: Salt has been added to the heavy water to enhance the neutral current efficiency. This marks the beginning of the second phase of detector operation. June 2000: SNO presentations at Neutrino 2000 give the current detector status. November 1999: Detector parameters frozen. Start of production data taking.